A while back, Radio Shack introduced micro RC vehicles called Zip Zaps. Not long after introducing those, they introduced a line of monster trucks that in my opinion, were way cooler than the Zip Zaps SE or even the original Zip Zaps as these monster trucks could drive for a much longer time and they can drive on carpet, tile, and most any surface you can think of. They’re also 4WD, which is really cool! After playing with one for a while with the stock motor, I had to have more of these, and along those lines, upgrade them w/ Radio Shack’s upgrade kits. I also discovered some mods that were available for the monster trucks to make them not only faster, but make more efficient use of the stock battery. The mod I’m going to detail facilitates neither of those end results. Instead, this mod attacks the charge level of the monster truck’s battery, thus translating into longer run time, especially for older, kinda worn out batteries. 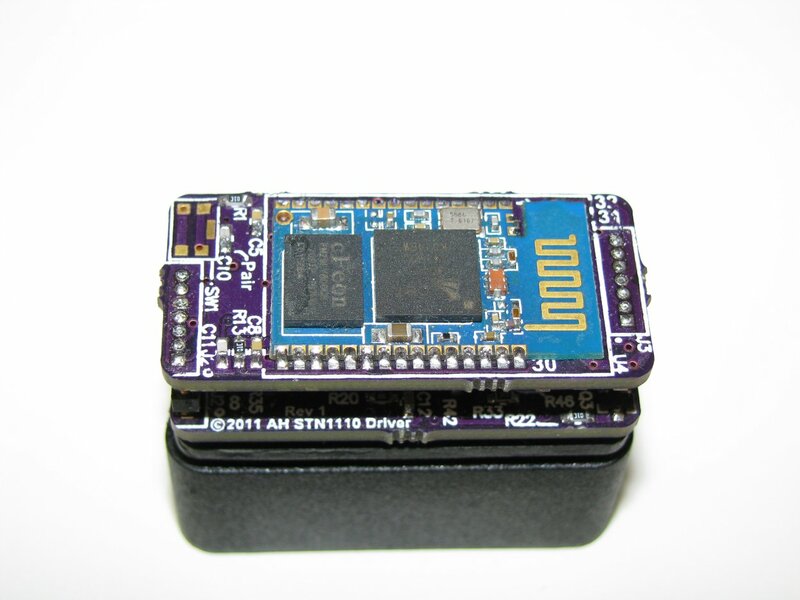 Update: Check out the STN1170-based Bluetooth OBDII Reader Preorder sale! Feel free to link to that page above if you’d like. This post will describe how to add a SuperDroid serial cable compatible header to the Dockstar. First, the Dockstar must be opened up. The case pops off relatively easy by inserting a screwdriver in the bottom seam that is below the LED that flashes in the front. Pry the bottom out slightly and then work your way around the perimeter of the bottom seam. Eventually all the tabs will be free and you’re now inside the Dockstar. The original instructions for performing the U-Boot replacement for the Dockstar came from Jeff Doozan at Jeff Doozan’s U-Boot Replacement Instructions. I have essentially mirrored my own copy of the instructions and his scripts for my own use in case his website went down. Plus I modified my own version of U-Boot w/ MMC support, so I needed his scripts to point to my U-Boot images and such. This post doesn’t really have anything to do w/ electronics, but rather the mechanical design of the air cannon itself. Revision 1 was pretty basic, just a single, small pressure tube (like a pressure tank on a compressor, just made out of PVC instead) and a tiny gas valve rated to 150PSI that ran on 120VAC. The gun was fired simply by turning a 120V switch on and then off again. This design was quickly retired for Revision 2 to get better range, be safer, and be able to shoot a variety of objects, particularly golf balls. Like a lot of my projects that I create, I intend to have the project perform some function that is useful to me, but at the same time, learn about some previously unused technology or feature. Due to this, most of my projects aren’t very cost oriented to reproduce what I’ve created. I will say that most of my projects are produced in small quantities for almost nothing. Most everything I’ve created with the exception of a few projects such as the Nixie Clock, LED Matrix Display, Thermostat, and OBDII Bluetooth adapters have been built almost entirely from reused parts or free samples. The main goal of the Pumpkin Lights project was to create a cool method of lighting a pumpkin instead of using a candle or boring old LED tea lights. I wanted something that could produce infinitely variable colors or even mimic a flame if I wanted it to. The technology I wanted to fool with were Microchip’s faster, cheaper 16-bit PICs and PWM (pulse-width modulation) LED control. Up until this project I had only used the 18F 8-bit parts. The whole motivation for this project was from a previous analog version of this, which was based on the popular “Fading Red Eyes” circuit that’s easily found on the net. While the analog solution worked, I didn’t have the control over the colors produced like I had wanted to. It still produced a really cool pumpkin display, but I knew I could do better. This is the Thermostat project I set out designing about a year or two after we bought our first house. Yes, there’s really no need to make your own digital thermostat as you can buy a good one for under $50, but since we were heating with wood, it suddenly became apparent that it would be really handy to be able to turn on the “AC” (the unit’s breaker was actually off, I just used the AC mode of the thermostat to circulate the heat from the wood stove) and also be able to turn on the furnace if the temperature dropped too low from the fire dying out or just not being frigidly cold outside. The wood stove has a hard time keeping the temperature inside above 68ish when it’s about 15 degrees or colder outside.